Biggest Baddest Water Slide Action! 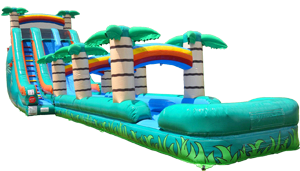 The Giant Tropical Slip & Slide features awesome tropical graphics and the slip & slide has tropical palmtree bridges to pass under, where kids then end up in the cool splash pool. Requires two seperate electrical circuits.